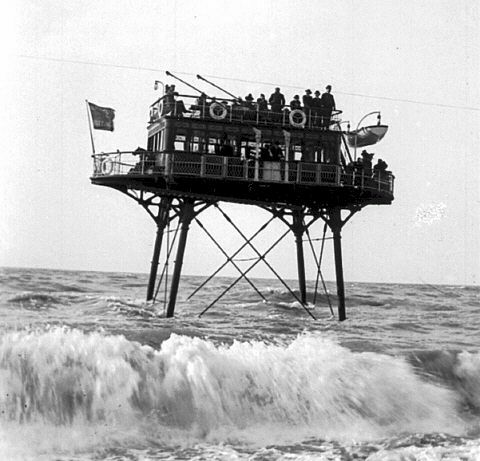 The Brighton and Rottingdean Seashore Elecric Railway, the so-called Daddy Longlegs railway, was built in 1896. The My Brighton and Hove living history and community website was launched in 2000 to celebrate the Millennium and now has over 11,000 pages. Every week, people add new memories, photos, knowledge and opinions about the city – as it is today and as it was in the past. The site is edited and maintained by volunteers. The website was inspired by the 1994 award-winning My Brighton touchscreen exhibit at Brighton Museum. Start-up funding was provided by Brighton & Hove Council’s Place to Be campaign. We receive no regular funding but have been self-sustaining now for 12 years. My Brighton and Hove won Best Community Site and Best Small Museum Site in the international Museums and the Web competition in 2008, competing with institutions such as the Tate, the Brooklyn Museum of Art, and the Science Museum. It was named Best Community Site in the Brighton and Hove Virtual Festival Web Awards in 2005, 2004 and 2002, and was runner-up in 2001 and 2003. It was picked out as an example of best practice in collaboration between a museum and a community group by the National Grid for Learning in 2001. This archive entry was last updated on 7 June 2014. Information incorrect or out-of-date?